If you believed some of the propaganda and rhetoric, then the short foot exercise (or its variants) are a panacea for all that does ails the foot, especially a lower medial longitudinal arch. Firstly, not one outcome study has been done, so we have no idea. Secondly, anyone recommending a 'one-size-fits-all' approach to anything is ...well, you know what I want to say. What is the Short Foot Exercise? In addition to the above, there is the body of evidence showing no correlation between muscle strength and arch height. How effective can it be? Going to stick my neck out here with a bold claim: The more likely that someone is to recommend the short foot exercise, then the less that they probably know about foot function and foot biomechanics. The propaganda and rhetoric is that this Short Foot Exercise is a panacea for 'flat feet', 'overpronation' or lowering of the medial longitudinal arch. Its not. What causes lowering of longitudinal arch? There are many many different causes of flat feet, 'overpronation' or lowering of the medial longitudinal arch. The short foot exercise is going to work really well if a weakness of the abductor hallucis muscle is the cause of it (its not a very common cause). For example (1): I have no idea how the fan boys expect any sort of muscle strengthening to work in those who have 'flat feet' from an osseous forefoot varus (actually I do know; reading what the fan boys write, they have no idea what forefoot varus even is). Its impossible to strengthen the muscles to fix a 'flat foot' due to an forefoot varus (well, if it was possible, they would be walking about with the big toe off the ground, and surely that is not a good thing). I can see the short foot exercise perhaps helping restore the arch in those with a forefoot supinatus, but something is causing that supinatus and it is unlikely to be a weakness of the abductor hallucis. And even then it is probably the action of the exercise in plantar flexing the first ray that helps and not necessarily the strengthening of the muscle (and, of course the fan boys have no idea of the functional implications of forefoot varus vs forefoot supinatus). For example (2): Probably one of the more common causes of 'overpronation', 'flat feet' or a lowering of the medial longitudinal arch is tight calf muscles. As the tibia move over the ankle its required range of motion and if it does not have adequate range at the ankle, the tibia continues to more forward by collapsing the midfoot (ie lower the arch, 'overpronates'). I would love one of the fan boys to please explain how the f the short foot exercise (or any other muscle strengthening) is going to stop this? I think you can see where I can heading with this. There are literally, 100's of causes of 'flat feet'. The short foot exercise is only going to help those in which a weakness of the muscles are a cause. 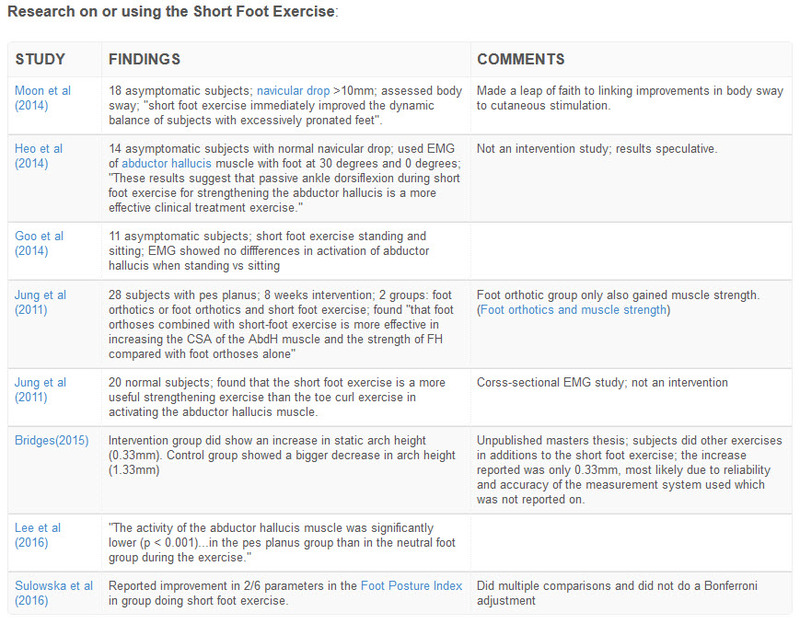 In the above table on research done with the short foot exercise, some of the subjects would have had, for eg, forefoot varus or tight calf muscles, so including them would have theoretically lowered the mean response as they would have been 'non-responders'. I have nothing against the short foot exercise. Of course, a stronger muscle is better than a weaker muscle. I get lots of people to do it - its just needs to be used for what it is for, minus the pseudoscience, woo and quackery of the 'one-size-fits all' fan boy brigade. Is the short foot exercise primarily an isometric exercise ? Thanks for an informative article. I found it very interesting. Thanks Craig for calling out these clowns.